How do I reorder questions in an assessment using Quizzes.Next? 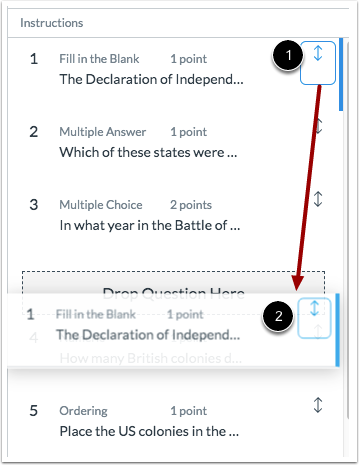 You can reorder questions in a Quizzes.Next assessment using four options: dragging and dropping in the Question Navigator, using the Move icon in the assessment preview, dragging and dropping in the assessment preview, and keyboard navigation. Click the title of the assessment you want to edit. To move a question in the Question Navigator, locate the question you want to move. Click the question’s Move icon  and drag the question to the new location . 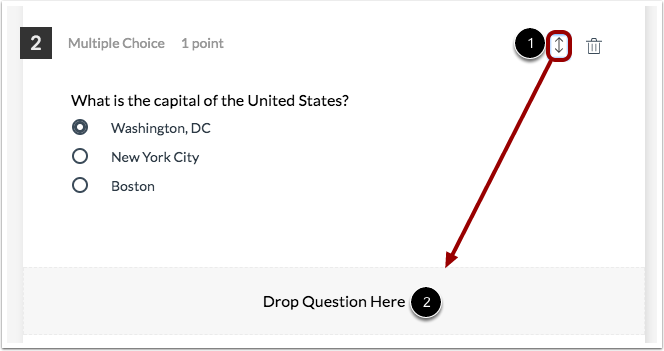 You can also move a question by dragging a question from the Question Navigator into the assessment. 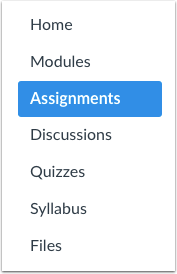 Click the question’s Move icon  and drag the question to its new location in the assessment . To move a question using the Move icon, locate the question you want to move in the assessment preview. Then click the Move icon. To move the question, select the option to move to the top , move up one place , move down one place , or move to the bottom . To drag and drop the question, hover your cursor over the Move icon . Then click and hold to drag the question . You can also move a question by dragging it from the assessment into the Question Navigator. Click the question’s Move icon  and drag the question to its new location in the Question Navigator . To move a question using keyboard navigation, press the Tab key until the Move icon is highlighted for the question you want to move. Open the Move menu by pressing the Enter key (PC) or Return key (Mac). 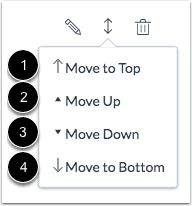 Then use the arrow keys to select the option to move to the top, move up one place, move down one place, or move to the bottom. Previous Topic:How do I add feedback to an assessment question in Quizzes.Next? Next Topic:How do I edit an assessment in Quizzes.Next? Table of Contents > Quizzes.Next > How do I reorder questions in an assessment using Quizzes.Next?